Megan Murphy rises for a kill at a recent practice. The Eastfield Harvesters are 1-1 in their first nonconference matches of the season. The Lady Harvesters put up a fight, pushing the match to five sets before falling to Arlington Baptist College. Eastfield won the first and the third sets by identical 25-22 scores, and dropped the second and thefourth sets by a 25-15 score, and the 15-12 in the deciding set. Karina Lay had 10 kills to go along with her 25 digs. Megan Murphy led the team with 16 kills. Grizelda Ortiz contributed a team-high five service aces. “I’m very proud of how we played, even though we lost, because we went five games with a four-year college,” said McKayla Petters, who had 37 digs. 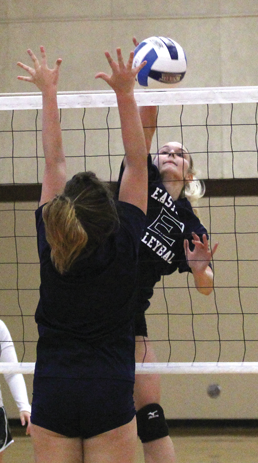 Eastfield picked up its first win of the season Aug. 24 sweeping Dallas Christian College 25-21, 25-18, 30-28. Murphy had a team-high 13 kills and 3.5 blocks. Lay had nine kills and 15 digs and Cailey Clogston added seven kills and four digs. 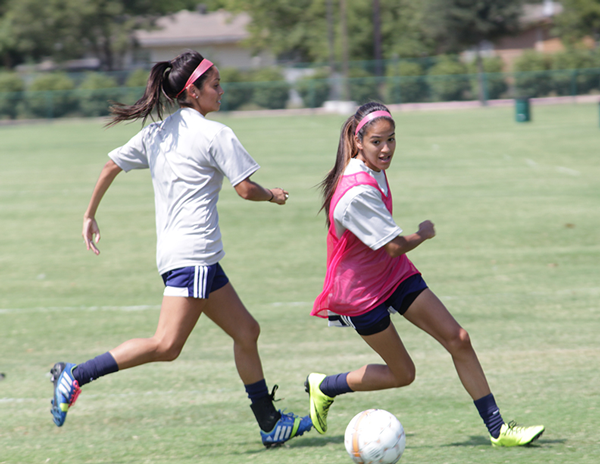 Eastfield will host Southwestern Adventist University on Sept. 3 in its home opener. “We know we can compete with anyone out there,” coach Brandon Crisp said.